“Once the tea plants are grown in the soil the leaves are harvested for more than 200 years! The leaves are then turned into the most-sought-after beverage ‘tea’. 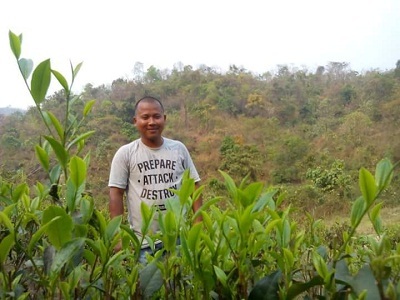 It felt a royal business to me and also Assam tea has good export prospects hence I diversified our ancestral two hectare farmland from paddy and vegetable growing farm into tea farm,” says Mr. Tenzing Bodosa, 34, owner Bodosa Farms. It is located at Kahibari village, Assam. The plants are nurtured with the agri inputs prepared in-house using the raw materials found easily near the farm such as cow dung, cow urine, wild leaves, weeds, fish waste and medicinal herbs etc. “To nourish the soil with beneficial microbes and provide nutrients to the plant I spray a liquid prepared from molasses and fish waste. To make the same I mix equal quantity of fish waste and molasses. It is left to ferment in cow urine (immersed fully) for two days. The liquid is then churned and sprayed on the plants,” he shares. When asked, it is always believed tea cannot be grown naturally as it faces constant attack of pests, he responds, “Pest do attack the tea plants frequently but it can be controlled with self made bio-pesticides. For example to control red spider mite I spray concoction made from marsh pepper (polygonum hydropiper). I ferment marsh pepper plant with neem and siris tree leaves in cow urine for three days. Later spray it on the plants and pest is controlled.” With steady use of natural farming inputs in the farm the growth of the plants is consistent, quality of tea leaves is superior, soil health is enhanced and pest attacks have reduced immensely. 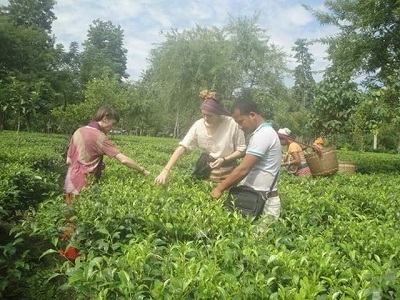 Tea plants are nurtured without any use of chemicals so it was wise to process it within the farm and sell directly to the end consumer at premium price! “It was risky step but I believed in my practices and bought micro-processing units from Punjab. I produce six thousand kg tea annually. It is green tea and orthodox black tea,” states Mr. Tenzing. Green tea is sold at Rs. 1500-2000/kg and black tea at 1200-1400/kg. 90% of the stock is purchased by foreign buyers and 10% is sold in the domestic market. Mr. Tenzing has trained more than 5000 farmers on chemical-free farming procedures. “These farmers come from neighbouring states, Bhutan and Nepal. Now they all are into organic farming but selling is problem for them. Therefore I want to buy leaves from them and process into tea. For the same I am expanding and upgrading my processing facility. Only constraint is finances yet I am determined to expand my operations,” he reveals his future plans. Bodosa Farm is unique in more than one ways. It is not only an organic tea farm, an informal training center but also an informal agri-tourism center and elephant certified farm. 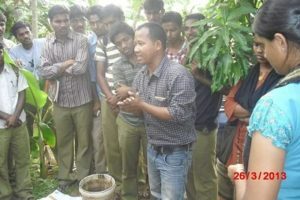 “I am growing more than 90 varieties of crops in my farm along with tea. All are grown naturally and sold locally. It is mix of fruits, flowers, grains and bamboo. Our village is located near to the forest so wild animals come to the farm only for food. As elephant eat bamboo so I planted the same exclusively for them as a result they do not spoil the rest of the farm and roam freely,” he asserts. 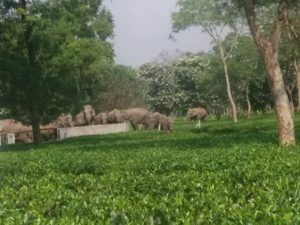 Seeing elephants roaming freely, having no electrocution risk from fencing, no drainage ditch and no poison in water, Wildlife Friendly Enterprise Network certified the farm as World’s first elephant friendly farm. Besides other animals and birds like deer, peacocks, hornbills also visit the farm regularly. This has attracted many foreign tourists who are hosted by Mr. Tenzing and his family with lots of warmth. “I feel happy to contribute to the environment and produce healthy food and beverage. Farming is great profession and I feel children of farmers must take it forward with pride instead of running away! Everyone should grow poison-free food best to their capabilities as in our Indian climate we can grow all the crops,” he concludes.